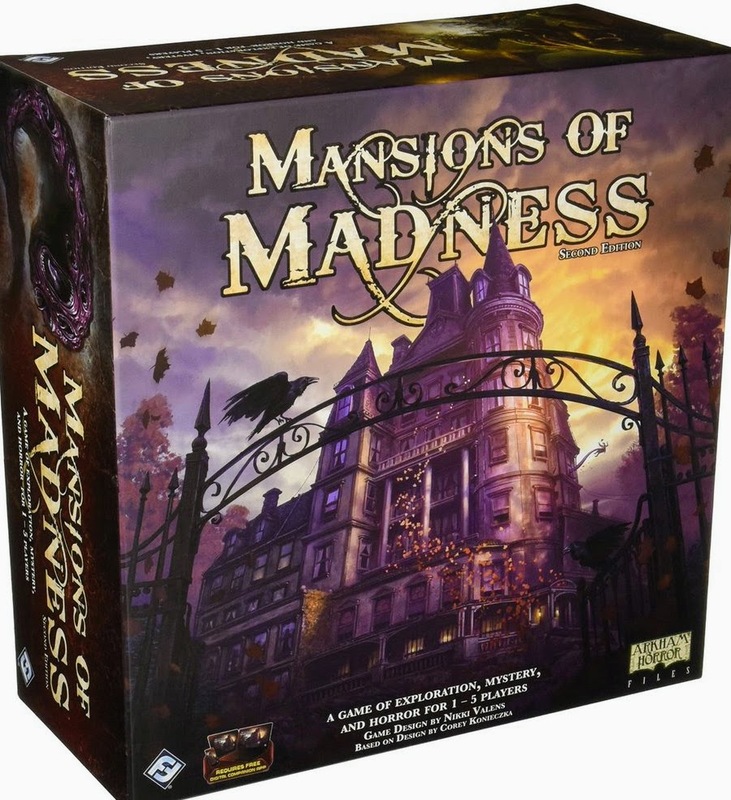 Mansions of Madness from Fantasy Flight Games is the second iteration of their H.P. Lovecraft-inspired world. In this cooperative game, you and your fellow players are trying to escape the horrors thrust upon you by a brilliantly designed and integrated app. However, what I personally found more difficult than it needed to be was inserting the miniatures token into the slot on the base. The manual indicates that you should do that after you've attached the miniature, which I duly did. However the lug from the miniature was not flush with the inside of the base, i.e. the slot in which the token should slide into was obstructed by the miniature lug. This caused several rips and tears on tokens which at the very least is annoying. I should mention that these tokens will never need to be removed (a good job, I don't think I could) and you can only see slight damage to a handful of miniatures' tokens. The app is absolutely integral to the game and will need to be downloaded before you play. You can get it on either iOS or Android, and also via Steam on Windows or Mac; the Amazon Kindle platform is also supported. If you don't yet own a device that can run the app then don't buy this game. Although the chances of anyone not having the ability to use this app in this day and age are very small. You need the app to drive the game system. The core mechanics of the game, outside of the app are simple and intuitive to understand. One slight concern I have with an app that is so integral to the game is of longevity. In 20 years time will the app still be around to play; will FFG still exist to support their back-catalogue of games or will it be obsolete? I own and still enjoy games released in the 70s and 80s, will I be able to say the same of this game in a generation or two? It is only a slight concern because aside from death and taxes, I am certain that there will be many more board-games to play and enjoy. In the Mythos Phase, the onboard monsters all activate and there may be some extra events or monster spawns which need to be dealt with. Although the players aren't aware (there's no clock or turn counter) there is an intrinsic timer in the app which ramps up the difficulty the longer your group is not progressing through the scenario. The longer you take the more extreme the Mythos Phase becomes. The app is very well designed and if anything adds to the level of immersion in the Cthulu-esque world with ambient sound effects. Interacting with the app is a very simple affair and even the most tech-allergic person will be able to control the app after a few turns. However, you should be aware that there is no undo button, once you've confirmed an action on the app you can't go back and do something else. If you confirm an action by mistake when you meant to cancel, you're stuck with that error. Obviously, you could house rule something but the app doesn't cater for Luddites of the highest order. Once wounded or insane, if your character receives damage or horror again equal to their wounded state, they are eliminated and all surviving players get one more Investigator Phase to finish the game. This is a good mechanism to deal with player elimination. On my initial playthroughs, I was often surprised at how well the game flowed, normally I find dungeon crawl type games to be rather clunky. The game designers and app designers have thought long and hard here, about the rules and the app's user interface. This is a very well designed game, in both theme, mechanics and delivery. This game tells great stories, it almost feels like a role-playing game. In my first game of the introductory scenario (we lost), we were being chased into a dead-end by some flaming, chanting cultists, all the while trying to prevent the fire from engulfing us. This may not be particularly unusual for the Vanderbilt mansion but it's pretty uncommon around these parts. It was easy to imagine the cultists in a trance, immune to the flames blistering their flesh, flickering over their clerical tunics, whilst lurching towards our unwelcome and unfortunate avatars. It's moments like these, where the game takes on a life/story of its own, that I play board games for. A movie or a book, great in their own right, will always tell the same story, a board game is different on every run-through. Combine that variability with a story-telling game and you've got a highly re-playable custom entertainment experience. During the course of your mission, your characters will pick up items, spells and conditions which are all handled by separate decks of cards. These are often double-sided cards whose text will instruct you to flip them and resolve the reverse effect on use. This adds some entropy to the game as, given 5 of the same spell cards, the reverse effect on each is different. After 'tapping' a card, you may be instructed to return the first copy of the card and draw another copy of the same card; the reverse on this second copy will be different. This is a very clever mechanism that changes the way the story unfolds on each play-through. This keeps replay-ability high and each play-through feels different and fresh. You can never be certain that the same spell or item will work as expected. I've played the provided scenarios several times, sometimes I encountered different starting areas and different end-game conditions. I was a bit disappointed upon losing my first game that I didn't get a 'cut-scene' on the app. That only seems to happen when your group wins. There was some concern in other game communities around the 'on-rails' story arc you'll be driven down with an app. I didn't find this to be the case at all. You have a plethora of variability between play-throughs. This is affected by character choices, starting equipment and your in-game choices to make each experience different. Even now I would like to go back and replay the first scenario again to see if I have seen it all. The physical base game and app include 4 scenarios. These are all constructed on your table using the 24 double-sided map tiles. The artwork on all the tiles is great, I found it evocative and immersive. You could expand your base game by purchasing 2 DLC missions in the app. If you're still feeling desperate for even more Madness there are also 4 physical expansions available for the game. I will be more than happy with the base box for some time to come although I can see myself buying the 2 extra scenarios before long. Not because I'm tired of the content in the original scenarios but I want to explore the Mansions of Madness world more, it is that appealing. The base box has an RRP of £92.99 which is a fair chunk of change and an amount that feels a little overpriced for what you're getting. But you'll probably be able to pick it up at your local game store for a little less than that. But what you are getting for that money, is a brilliant and innovative game whose app-driven mechanic was, and probably is still, the best app-driven board game experience out there. I felt engaged the whole time and it was a pleasure to see those I introduced the game too, after the slight hurdle of rules explanation (not that they're hard), really get immersed into the theme and be invested in their player characters. Mansions of Madness is a clever and engaging system that will keep you coming back for more because you almost certainly will not complete each mission in your first or even second play-through. Mansions of Madness melds a modern board game with a digital medium so successfully that many others have and are copying the formula. I can only assume that what FFG has started will continue and get more prevalent in the hobby.